Blasting has started at a west Cornwall tin mine with the aim of eventually restarting production. 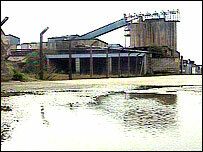 South Crofty, Europe's last tin mine, closed as a working mine in 1998, bringing to an end a 3,000-year-old tin mining tradition in Cornwall. The blasting of a new tunnel at the mine - a six-month operation - is to be followed by the "major step" of pumping out the mine, owners Baseresult said. Since its closure, the mine's 300 miles of shafts and tunnels have flooded. The water, an estimated total of 4.5 million gallons, is at a depth of 700 metres and within 61 metres of the surface. It has so far attracted 1,500 people, who have been able to penetrate 46 metres into the workings. However, the company which has owned the mine since 1991, Baseresult Holdings Ltd, said it is "two years away from being able to mine and produce tin". It also said it predicted there would be an "80-year life for this mine". The chairman and technical director of owners Baseresult, David Stone, said: "We think this will be a highly profitable operation." Mr Stone said when pumping began to expose levels of the workings, the firm would be able to mine tin. Baseresult said: "It is a very exciting step forward and represents yet more evidence of our absolute determination to get South Crofty working as a full operational tin mine again." The company said improved mining methods meant lodes, or veins of tin in the mine, previously considered uneconomic would be made available and viable. The company said changes to working practices could help cut production costs by 30%, while maintaining pre-closure production levels of 200,000 tonnes a year. However, the Camborne, Pool and Redruth Regeneration Company wants to push through a compulsory purchase of all or part of the site so it can improve the run-down area.